Welcome back to IABC/BC! I hope you’ve had a great summer. 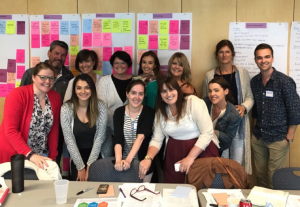 While fall isn’t here just yet, the IABC/BC Board has been hard at work this summer planning an exciting menu of programs and activities for this year. I want to share a little preview of what you’re going to see in the coming weeks, from learning about how IABC/BC can help you connect with communicators to growing your network and advancing your professional career. We heard your feedback in our annual spring Member Survey, and we’ve taken this into account in our plans for the year ahead. IABC International updated their vision, purpose and philosophy earlier this year, and I’m proud to be a part of an association that visions us as professional communicators at the heart of every organization. You can read more about the updated IABC governance here. This summer we held two strategic summer planning sessions, and in July we even paused to take a group photo to share some behind the scenes with you! This A-Team will be profiled in September, so you can learn more about our full board. Membership – We are here to answer all your questions about membership. If you’re about to renew, considering joining, or haven’t been here in a while and want to reconnect, start with Membership to help you Get Connected with us. Certification – We hosted our first CMP exam in May 2017, and we’re planning to host two more in 2018. If you’re considering becoming a certified communications professional, stay tuned and watch this space! Special Interest Groups (SIGs) – For the first time in our chapter history, we have a director on our board dedicated to SIGs to help you connect with your peers in areas of related skill sets, industry or experience levels. We have a couple of new groups planned and we’re looking for more chairs to lead groups too. If you’re interested send a message to SIGS@iabc.bc.ca. Volunteers – As a volunteer-run association, we truly could not offer the programs and activities we do without you! There are so many benefits to getting involved, and we are always looking for more volunteers. Look at our current opportunities throughout the year to find out what we’re looking for, but don’t let that stop you from asking about opportunities, because sometimes we have roles in the works and just haven’t posted them yet. We’re still looking for a few more portfolio managers as well, and you can learn more about these roles here. If you have any questions contact us at volunteers@Iabc.bc.ca. Gift of Communications – A beloved program at IABC, which connects communicators with non-for-profits to give the gift of communications. The program is returning this year, so watch out for more information, and if you can’t wait to learn more and want to help this program be the best one yet, send us a message at careerdevelopment@iabc.bc.ca. Events – Last, but not least, we have new networking and professional development events (such as speaker events, workshops, etc.) planned for you. We start with our fall kick-off event coming up in September, then in October we’ll have the IABC Canada West Regional Conference in Kelowna, and back by popular demand, we’re aiming to do another media crawl event, plus much more. Instagram – That’s right, we will be joining the world of Instagram with all of you this year. Watch this space for more details as we launch this new channel to follow all of our IABC/BC activities and BTS (you know, behind the scenes). We also have more programs and activities planned around students and new communicators, mentorship, and more! If you want to get involved with the chapter this year and help deliver any of the above programs, get in touch with our Volunteer Services team at volunteers@Iabc.bc.ca to learn more. We’d love to have you! Can you tell that we’re excited about the year ahead? Well, we are! If you think we’re missing something that you’d like to see offered to give you better value for your membership, then please let us know. I’d like to hear from you personally at president@iabc.bc.ca.